House of Blues Celebrates 20th Anniversary With Santana "Wings Of Legend"
On January 16th, a 13 foot steel, glass, and bronze replica of a PRS SANTANA signature guitar was unveiled in front of House of Blues Las Vegas in Mandalay Bay Resort & Casino in honor of The House of Blues first resident Carlos Santana. The statue was created by premiere American artist and innovator Dale Evers. 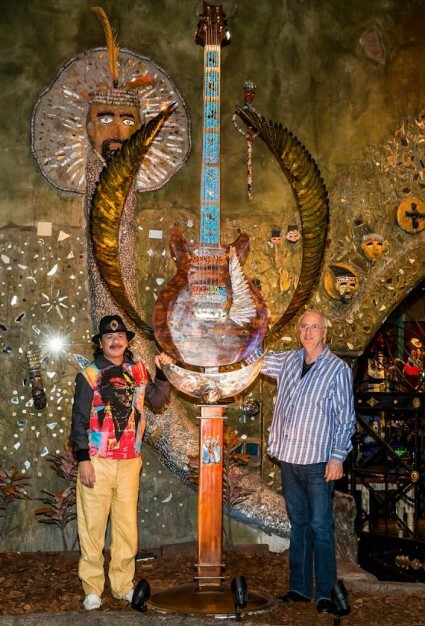 This immense sculpture is entitled “Wings of Legend.” It represents the tens of millions guitars that have become an intrinsic part of American pop-culture and pays homage to the artistry of Santana and his relationship with PRS guitars. “The sculpture truly embodies the magnificence that is Carlos Santana,” says Artist Dale Evers. “It is an understatement to say I am honored and greatly appreciative for this grand moment in my life.” Evers’ unmistakable signature is characterized by a masterful fusing of glass, bronze and steel into creative realities. His numerous commissions have lead to permanent installations throughout the US and Mexico. Are you a Carlos Santana fan? Be sure to check out Creative Bone Artworks,: “Art That Rocks” Collection – specifically the Carlos Santana print from artist Tom Noll! Limited Edition prints are still available of this amazing Carlos Santana artwork! Contact Tom Noll directly to inquire about ALL art prints for sale. Place your order now for immediate shipment!